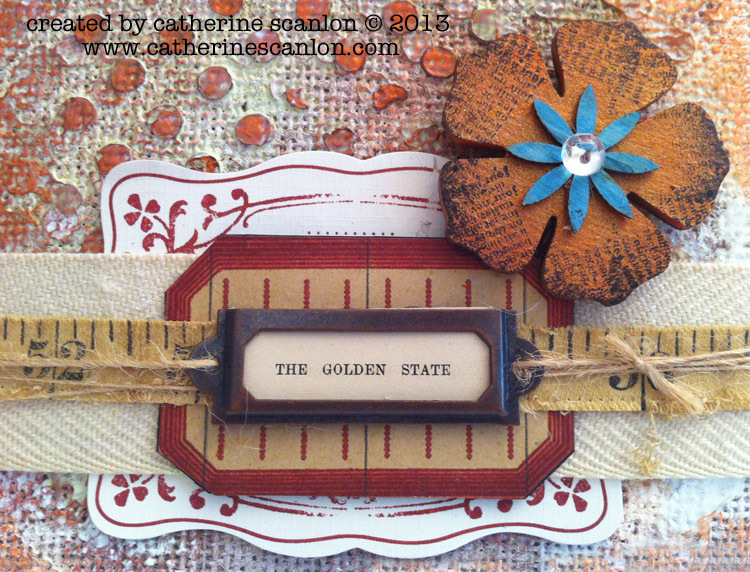 Hello everyone, Catherine Scanlon here with my first Guest Designer Post for eclectic Paperie. Before I get to that I'll share a little bit about me. I live in Maine, not quite 2 hours north of where Kim keeps her shop and studio, and in fact -- I'll be teaching two classes at the studio in the next few months. You can find out some details about the September 14th class, Art Journal Toolbox here. The October 12th class, Image Transfer Art details are here. If you don't live locally, you can check out my Google Calendar page to see where I'm teaching -- for both my on-line and in-person classes. So, getting down to business -- Kim sent me some fun elements to work with for my first post as a Guest Designer -- and I created this fun canvas to share and inspire you with. 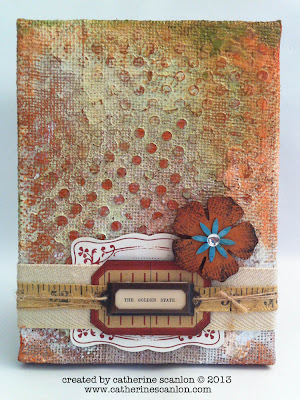 Here's how I created the texture on the Tim Holtz burlap canvas, isn't it heavenly?? To seal the burlap and prevent the paints from seaping through the burlap I sealed it with white Gesso. I dipped a credit card in the tub of gesso and scraped it all over the canvas. When that was dry I used the same credit card to spread Tiger's Eye Dimensional Paint from Art Anthology over the Swiss Dot Stencil from TCW and let it dry over night. As you can see in the close up below the dimensional paint was pretty thick in some areas. Next I needed to tone down the Tiger's Eye color, so I brushed white gesso over the entire canvas and then spritzed it with water. When I tipped it up on its side the watery gesso dripped down and left the perfect amount -- thick here and thin there. When the gesso was dry I grabbed my silks and my water bottle. To get nice drips of the orange and green I used a paintbrush to put a nice blob at the top of the canvas -- before it could dry I spritzed the water over it and let it drip down the canvas. It's a good idea to wait for the different colors to dry so you don't end up with mud. I did several layers of green and orange drips to get the final look. That was it -- though -- it was so muggy here over the weekend that I waited a day in between each layer of paint. Not the way I usually work but the burlap was really saturated each time and I wanted it to be mostly dry before moving on to the next step. I waited another day to add the embellishments, shown below. The flower is from Wendy Vecchi, I really LOVE these floral art parts! 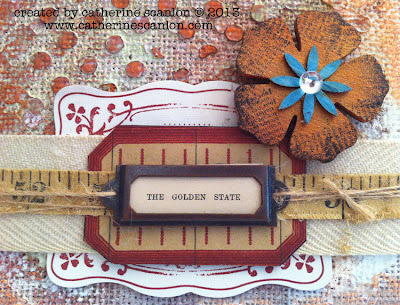 I painted the flower with 3 heavy coats of silks then stamped some text around the edges. Kinda grungy and perfect for my canvas. To complete my canvas, I used a hot glue gun to add the embellishments and secure the ribbon and tape measure on the back side. 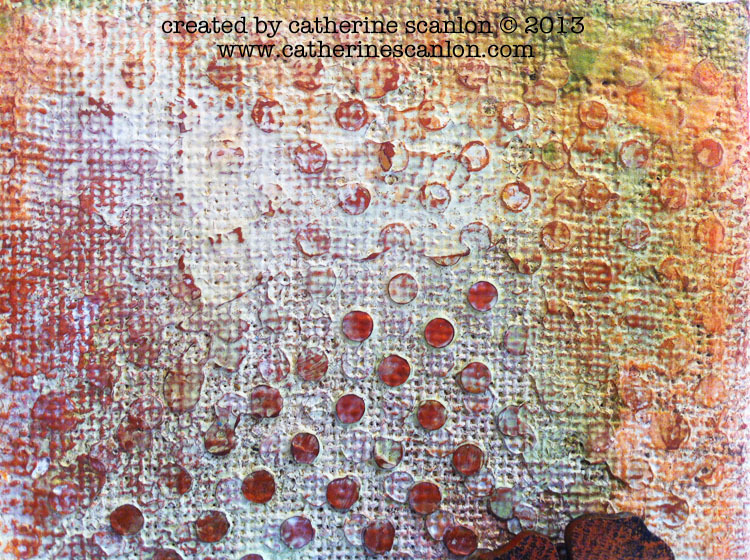 I love how it turned out -- and really enjoyed working with the Dimensional Paints and Silks. I'll be back next week to share some of my own products from Art Gone Wild! and Friends with you! Enjoy your week and thank you so much for stopping by today! I really love how you did this canvas! I love Silks too and never thought of using them as you did. Great canvas and great ideas! Beautiful canvas. I love the dimensional paint effects. The silks were amazing. AWESOME texture, absolutely love it. I love the burlap with the gesso'd stencil and silks..... I have got to play with those more. Never would have thought to use them on a canvas like you did. Wonderful canvas. Welcome Catherine! LOVE your canvas!!!! The texture you created is amazing! The colors are awesome! You hit it out of the park! 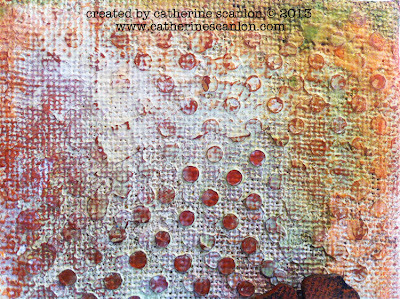 Waving hi Catherine ..love what you did with the canvas, it has turned out beautiful with a ton of texture! !